2D Shape finder: The students have to choose a shape and answer questions to identify what it is. 3D Shapes: Gives examples and descriptions of 3D shapes, (cone, cylinder, cube, sphere, cuboid, pyramid) and where they could be found in everyday life. Naming 2D shapes: Interactive activity for students to identify what each 2D shape is called and to describe its properties. 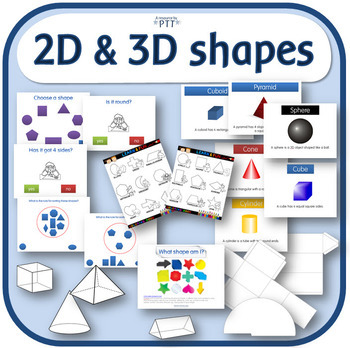 Naming 3D shapes: Interactive activity for students to identify what each 3D shape is called and to describe its properties. Sorting shapes: The shapes are grouped according to certain properties - the children have to describe these properties. What shape am I? : Describes a shape and the children have to select the right one. 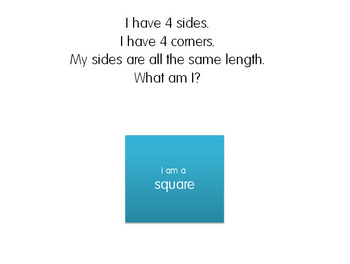 Guess my shape: As above, but the children have to click on the correct shape. Shapes: small colored shapes to cut out for activities.